This post is part of the Lion Seats project created by Richard Bentley. You can read more about the project here. Resting for a second on a bridge straddling the two halves of Heron Island, I noticed a flicker of shimmering green on the bank of the river. Adjusting my position to see past the reeds, a kingfisher stood, resting momentarily to inspect the water below, before darting off to the jetty on the opposite bank. This felt like an auspicious start. 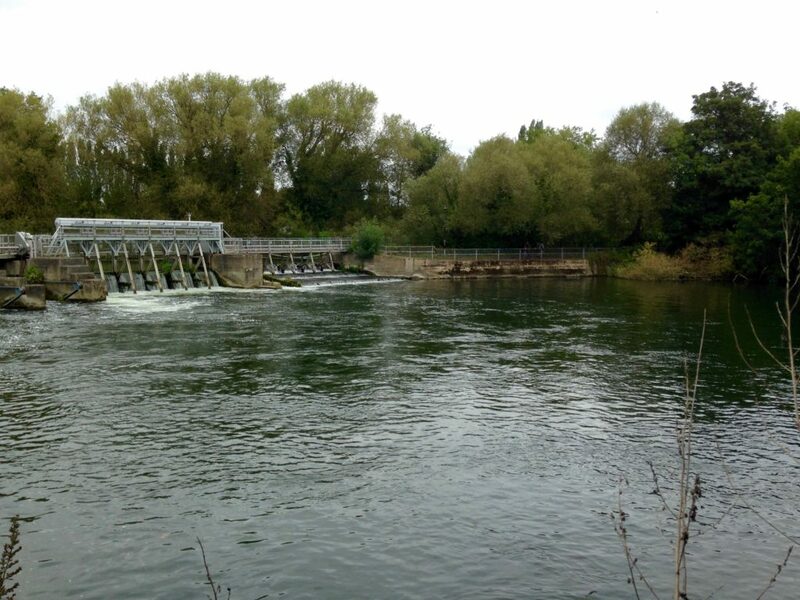 Continuing my leisurely stroll upstream towards Caversham Weir, the restful sound of birdsong and my footsteps on the leaf-strewn track were only intermittently disturbed by the rumble of air traffic overhead. Nearing the weir, I noticed the effectiveness of the acoustic baffle formed by the trees. I was surprised to find that the weir was largely imperceptible, until I was within twenty meters of it. Only when the trees flanking the footpath thinned-out, did the thunderous rumble of the weir become noticeable. At this threshold, I veered off to the right, spotting a small clearing by the river bank overlooking the weir. I set about assembling my recording equipment, extending the front legs of the tripod to compensate for the sloping bank down to the river, attaching the blimp which housed the microphones and adjusting the gains on the portable recorder. Finding a dry spot of grass on which to sit, I turned my attention again to the relentless torrent of white noise that dominated the soundscape. Amplified through headphones, the weir’s size and force was magnified, low frequencies rumbling more threateningly than when heard by the naked ear. From above the roar, amplification brought-out the doppler-drone of aircraft circling for Heathrow, sirens of emergency vehicles, horns of diesel locomotives on the Great Western mainline and construction noise from yet more glass-clad office buildings for which Reading is famous. Taking off the headphones to start the meditation timer, I noticed how the weir masked all but the loudest peaks of these interruptions, leaving me feeling cocooned on the shore of this small river island. As the automated bell of the timer was invited three times, I lowered my gaze and rested it on the reflections of clouds distorted by the small waves reaching me from the weir. My eyes focused on the ripples and the grey clouds behind them, almost believing they formed the bed of the river here. Slowly drifting eastwards, the clouds appeared to be swept along with the rivers’ flow. Closing my eyes to turn my attention inwards to my breathing, a mild dizziness came over me. The shifting images of clouds and waves had stopped, emboldening my remaining senses to adjust to feeling more firmly anchored to the river bank. Whilst being a stone’s throw from the town centre, the weir effectively masked the familiar soundscape of urban sprawl beyond. The weir’s endless, scarcely fluctuating roar provided a certainty which was reassuring and restful. Without the distraction of urban clatter, of signals and cues, movement and purpose, networks, transfers, commerce and industry, I settled quickly into my assignment, to simply follow the in breath and out breath. With other work on hold until the following day and plenty of time on my parking ticket, I could afford myself this luxury and allow the weir’s strangely calming interference signal to sever links with plans, deadlines and projects. After a few minutes, thoughts, like the clouds I had been watching pass across the river bed, seemed altogether more distant and ephemeral, well at least for brief interludes. Yet, whilst I felt shielded from distraction by the weir’s gentle onslaught, there lingered a slight unease at being unable to hear passing visitors. Interesting and eye-catching microphone set-ups can deter people from disturbing a recordists seclusion, particularly when they are adorned with headphones. However, my position with a view across the weir also meant there was the chance that someone would notice me from the footpath crossing it and would wish to have their curiosity satisfied. Certainly, the roar of the weir, would give me little time to collect myself and prepare an account of my presence in the event of someone approaching. Such distracting thoughts were hard to shake, but eventually my mind relented and gave in to trusting passers-by to afford me some solitude, or at least to trust myself to respond to an enquiry without frustration or resentment. With three more sounds of the bell, I moved slowly to pack-up. I left feeling pleased to have found a small corner of the town, just across the river, that I could return to should I crave some detachment from the busyness and bustle.